Ohhhh how we were not playing Tiddly-Winks on Saturday. The day started with a 40 minute delay. Because of the windy conditions we had to wait on the Cat 3’s to clear the course. We all know what that means for us ole guys…cold, tight muscles. The roll out started out nice and tame, but once we turned right into the wind, the race was awn! The race started with the usual players attacking and trying to split the field up and it worked. Weber fired off on a hard attack and 20 minutes into the race I found myself in the lead group of 8 or 9 with the usually players, fighting for a spot to hide. With nobody wanting to work together and 15 minutes in the gutter I found myself in a spot of bother and fell out of the group. I was able to regroup with 4 guys, including the dude with the white tube socks and hairy legs (kinda embarrassing), and the chase was awn. We chased for about 20 minutes or so and came to within 75 meters of the lead group, who were very disorganized and a classic bonehead move was made by my fellow combatants. We made another right hand turn into a vicious crosswind and rather than continue to work together, two of our small party decided to pull hard around us on a hill…ultimately dropping us. Lets just say they did not make it. My new friend and I regrouped with the next group, which was occupied by Lil Mike Adams, and the next chase was awn. Our group seemed to be working well, but time with this group was to be very limited. After crossing the start finish for the second lap, a gust of wind blew hard. One of the riders over corrected taking us both into the grass. That was the end of my time attending this party. Not only did he take me in the ditch, but he turned around and headed home! Leaving me out there all by myself. I thought about quitting, but did not want to start the year off with a DNF. Not to mention hearing the Wrath of sheeeeeet I would get from Weber….so I rode on. It was not long before I looked over my shoulder and found a small sea of ORANGE leading the chase lead by Weber, Richie and Johnny White Shoes. Once we regrouped and got organized the three of us worked really well together and started to make up some ground. We made a right hand turn on the only road where we had a little relief from the wind and picked up a nice tailwind. We drilled it for about 15 minutes and before our last right hand turn, our group had dropped from about 15 to about 8….must have Johnny White Shoes high pace he was pushing in Zone 3….or whatever you guyz with coaches call. We got the group ahead of us in sight and shut it down to let some of the other riders move up and do a little work, but you guessed it…nobody did. We rolled in to the finish line and JWS drilled it up the hill. With Weber on my wheel, we jumped about a 100 meters out, but with the stomach bug fully set in by now, he was not able to go. Took the sprint for a solid 12th or 14th….who really cares I guess. “It was definitely the hardest conditions I have raced in” was quoted by Weber and coming from him, that says a lot. Not a bad showing for the Teams first race. Mike Adams in 10th, me 14th with Weber and JWM right behind. Lots of fun boyz and I look forward to many more good times this year. Out! Mas-O-Menos - Spanish for Cramps and Dehydration! 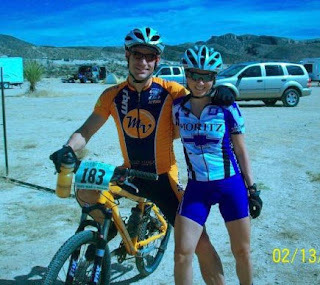 Bibi and I spent the weekend in Terlingua Texas for the Mas-O-Menos Marathon Mountain Bike Race. Terlingua is close to the Mexican border, just west of Big Bend National Park. The brave people that live there like to call it "God's Country". Assuming God is a horny toad that enjoys dust and the occasional Chilli Cook-off, then I suppose they might be right! It really is a great place though and the bike racing is totally unique. The course is two 50k laps, featuring a treacherous two mile climb, followed by a fast rocky five mile decent to the finish. The sun also plays a huge factor as the sky is usually cloudless and there isn't a tree over three feet tall. On the second trip up the climb you can definitely feel it. I raced the 40-49 class. We had 60 starters with only 40 finishers. I hung on for 11th. Bibi finished 3rd in the women's 30-39, once again scoring the only Miller Family Payout! Bryan Fawley won the overall with an amazing time of 4:05, almost 10 minutes ahead of second place. That guy is scary fast on the mountainbike.